Welcome to the Palacio Condominium complex vacation rentals. This complex is located on the beach in Perdido Key, Florida. With multiple community pools, deck area, community grills, breath taking ocean views and private beach access, this complex will provide you with the perfect vacation experience. When staying in one of ECBYO's Palacia condos you are able to enjoy all of the amenities and necessities you could ask for while on vacation, these luxurious condos have a homey feel to them that will make for a comfortable getaway. 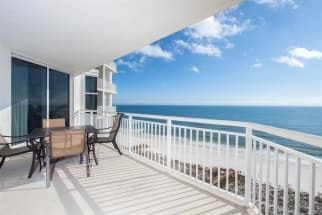 The Perdido Key area is known for its seclusion and peacefulness. You can expect privacy on your vacation, yet you are not far from lots of fun filled activities like deep sea fishing or shopping. If you’re hungry some of the local favorite restaurants include the Shrimp Basket, the JellyFish Bar, and Fisherman’s Corner. The Palacio is awaiting your stay! Book your trip to the Palacio with Emerald Coast By Owner. Our property owners will gladly help you plan your stay on the Emerald Coast. Booking direct with the property owner allows you to ask the owner important questions before you book, while also assuring you are not over paying for your rental. ECBYO does not charge any service fees like other listing sites, so book online today and save!